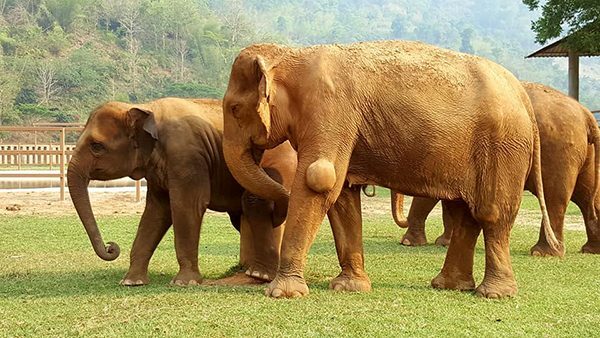 Yai Bua is an old lady elephant arrive to ENP on January 2016. She came from Pattaya where she worked at a trekking camp and she worked all day, every day giving rides to tourists. She is very old (100 + yrs) and has had 5 babies in her lifetime, unfortunately she has lost each one due to a variety of circumstances from her previous life. 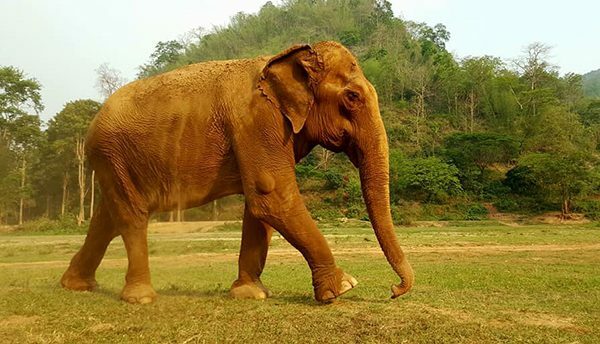 Yai Bua is now living with her new family, she join Khamla’s herd . She is the nanny of KhamLa and they help her a lot to be more confident and have a strong will to live. 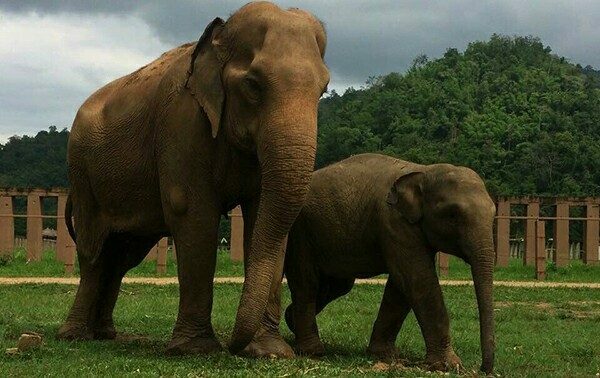 Yesterday, we let our new arrival baby Dok Geaw to meet with Yai Bua as we see when Yai Bua walk pass Dok Geaw’s shelter both of them interesting in each other. We opened the door then Yai Bua walk straight to the baby. 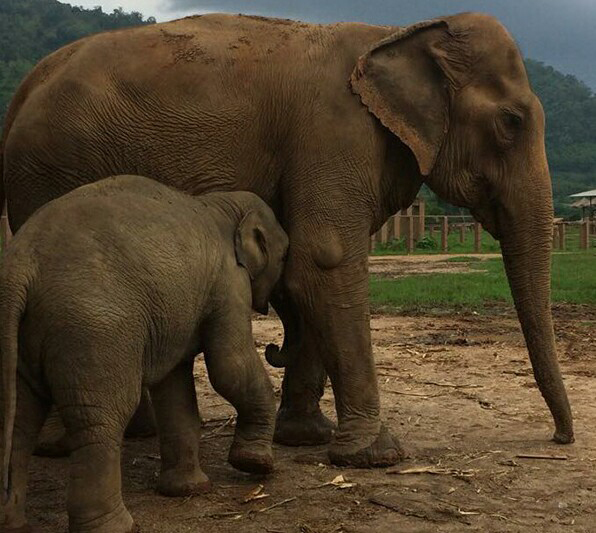 The poor baby who lost his mother since he was only 4 months did not refuse to get close to Yai Bua. This is not surprised us to see the gran-nanny stand near the boy and wait him to walk to her then he use his trunk to touch her breast. Yes !! 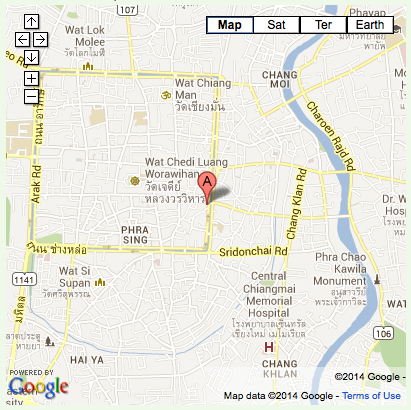 he’s trying to get milk from Yai Bua. 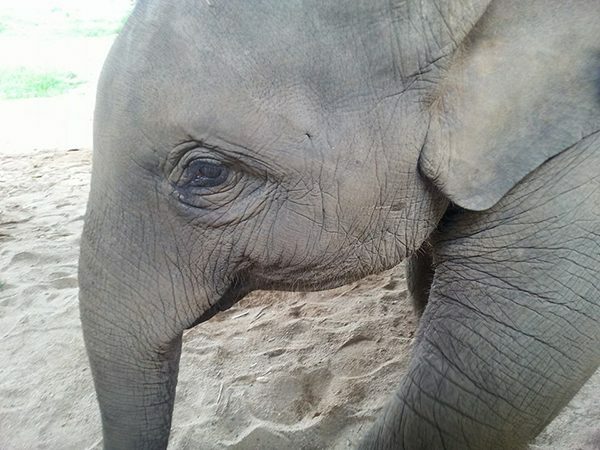 Since the lost of Dok Geaw’s mother, the poor little boy stay alone at Thai Elephant Conservation Center his care taker tried to introduce him to another female elephant and hope they could form the relationship but it was not satisfy. On his first arrival to the park, we keep him stay in the shelter as he is the new member and need times to settle in. Next day, we let him walk out from the shelter to the river in the evening. He was totally enjoy himself in the water but did not get confidence to join with the others. 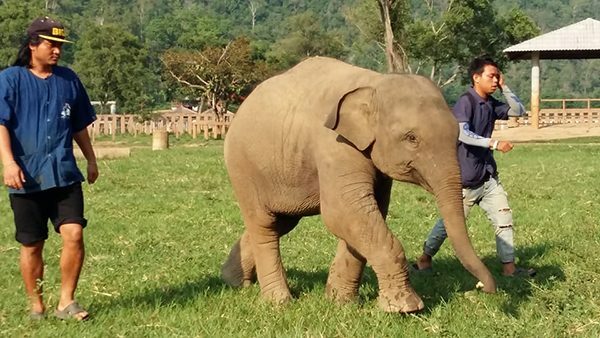 Everyday, the mahouts take him to walk out from the shelter he is so curious and more playful. 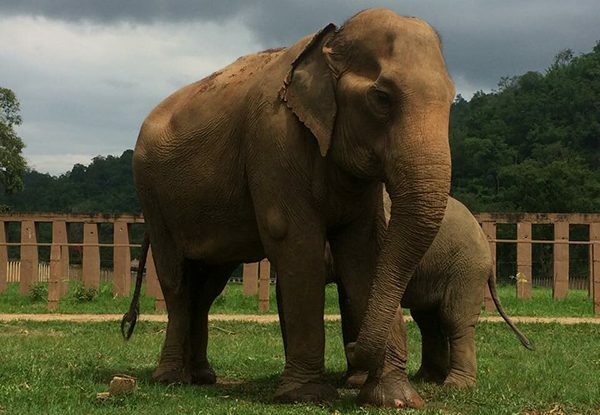 Dok Geaw, Yai Bua and Khamla seems get along well, three of them spent time together in the river. 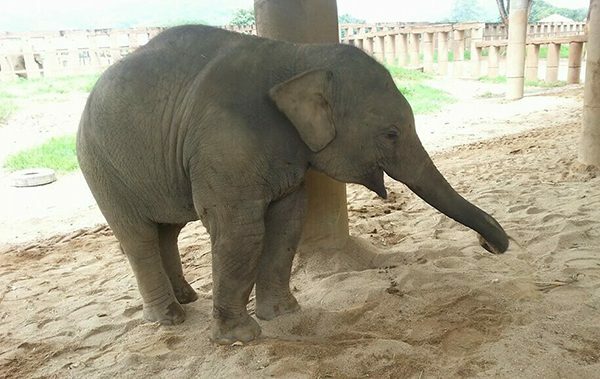 When we see the grand nanny who lost her babies and the orphaned baby elephant who lost his mother meet each other, we hope they could connect and fulfill their life with love from each other. Please stay tuned for the next update. This makes me so happy…. I was there on Monday and I saw her stop and visit him on her walk by his shelter! I hope that these two create their own little family! What an amazing story. 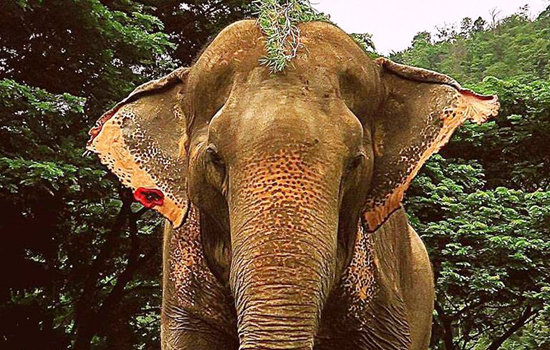 I am continuously reduced to tears at what some humans havedone to the animals of the Earth. But then I come across an article like this and it not only restores my faith in humanity but gives me hope! Keep up the fantastic job you all are doing. Thanks for all your hard work & sharing with us.